You are currently browsing the Mario Fux blog archives for December, 2011. On the 1st of December it’s (was) exactly half a year since this year’s Randa meeting started. Does anybody remember that we had 5cm snow on the first day? It’s not particularly special on this time of the year at the northern hemisphere but was quite special for the beginning of June – even for the little village in the middle of the European Alps. In the last few weeks Randa was again topic on the KDE universe (Kdenlive release 0.8.2.1, KDE Frameworks dicussions, etc.) and as I finally finished the sponsors report German only) for the meeting I thought it’s a good time to write a summary from my side of the meetings. Following you get some general information about the meeting, some statistical data extracted from the survey and a link to a photo gallery of the meeting. Actually my last post here was on the 1st of June with some nice snowy pictures. This year we had 57 persons in Randa of which 7 were responsible for organizational tasks and the kitchen. We had a really great kitchen team (thanks to the chief and my parents!) which had a lot of work to feed the hungry hackers. I think the chief is still surprised how much KDE people can eat . The remaining 50 persons were distributed in four and a half groups where the Platform_11 group consists of the biggest amount of people. 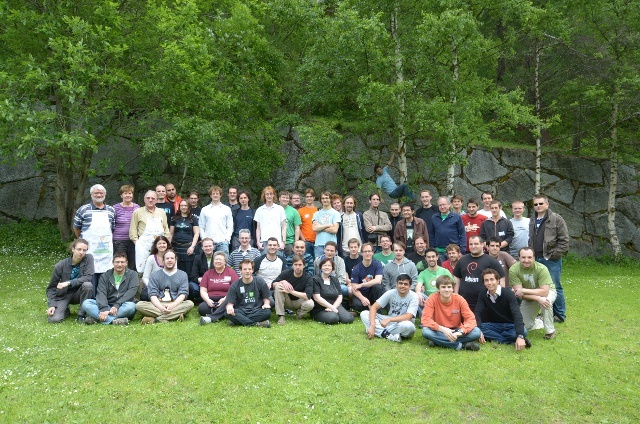 The other groups were Nepomuk, Kate/KDevelop, Multimedia/Amarok and the last now traditional part of the Randa meetings was the Kdenlive group. Two third of the participants answered the survey and all of them ticked off that would like to come to another meeting in Randa. General remarks as „Awesomeness“, „Rock on!“ or „Amazing!“ weren’t the exception. Eight percent of the participants were women. The youngest attendee was 18 years old and the oldest was 69 years old. I.e. the average age was around 29 years. 68 percent of the answerers were in Switzerland for the first time in their life. With questions about the infrastructure, the food and the competence/friendliness of the organizers the last two questions got the best marks: 2.86 and 2.90 (3 was the absolute best mark and 0 the worst). The taillight of the marking were the questions about WLAN and the beds or noise generation in the house respectively. With values close above 2.50 the house, the location Randa and the food got quite good marks. But will there be a fourth one and when will it happen? As probably some of you already know my family will grow next year and thus some of the priorities in my life are changing (which is absolutely ok or better not just ok but great as B. and me happily expect to welcome this new earth being). Therefore I added to myself some preconditions which I need to fulfill (and promised my chief B. to fulfill before I start to organize the next Randa meeting. I definitely want to happen more Randa meetings and want them to become a yearly event in Randa’s schedule. This year we wired the whole 150 years old house to have a-ready-to-use infrastructure. At the start of next year I’ll work together with some interested people to bring the Randa meetings to a better legal foundation. We plan to found a non-profit organization which will be responsible for the next meetings, finding local sponsors and supporters and things like the financial stuff or visa invitations.